The first "Weird Al" Yankovic LP. 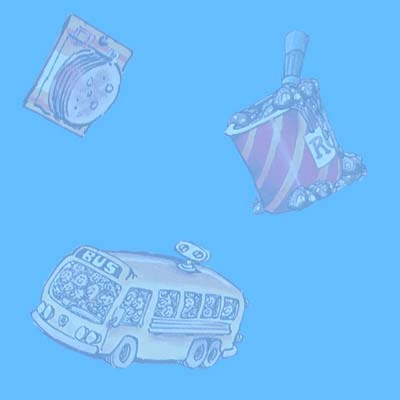 Production Summary: "Another One Rides The Bus" was recorded live when Al premiered the song on The Dr. Demento Show. Eleven songs were recorded for this album, while three ("Ricky," "Buckingham Blues," and "Such A Groovy Guy") were newly written specifically for this album...the others had been previously demoed and played at various times in the past on The Dr. Demento Show. Tour Status: As of this update, 66% of this album has been included on a regular tour setlist. In addition, a number of other songs--"Ricky," "I'll Be Mellow When I'm Dead," and "Such A Groovy Guy"--have been performed on occasion either apart from a regular tour or for a special once-in-a-lifetime occurrence, making 91% of the album having been performed live at one point or another. "The Check's In The Mail" remains the only song on the album yet to be played live. The jacket artwork has a visual reference to every song on the album. Two versions of the jacket exist: One with a red UPC on the back, and one with a white UPC. Al thanks Dr. Demento on the back of the LP jacket. For reasons unknown, only song artists would be thanked on future albums until 1992's Off The Deep End. Afterward, every studio ALbum has thanked The Good Doctor in some way. Most of the songs on this album are remakes of songs that had originally been issued as singles or had been featured on The Dr. Demento Show. Etched onto most copies of the record on Side 1: "An Accordion is a Terrible Thing to Waste." On Side 2: "Eat Your Broccoli!" The artwork on the back of the LP jacket depicts a real-life photo of Al and the band performing on stage. As he's performing, Al is daydreaming about being in bed with his accordion (a flip-flop of the album's cover). This back cover can only be seen on the LP version of the album and on the long box that the original CD release was packaged in. It is missing from every other release of the album. 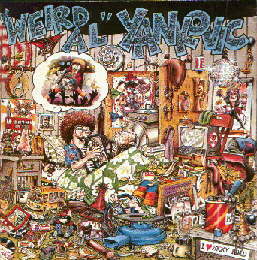 The photo (minus the daydream balloon) would resurface in 2009 on the back of the jewel case for the Essential "Weird Al" Yankovic compilation. Debuting at #196 in Billboard, this album had the worst debut of any of Al's work. It would stay on the "Billboard 200" chart for eight weeks. "Weird Al" Yankovic ©1983, 1990 Scotti Bros. Records. ©1999 Way Moby/Volcano Entertainment III.